#MySundayPhoto this week was taken in the New Forest, which turned out to be the perfect backdrop for images for my blog post on how we can all put our #HatsOn to raise money for BBC Children in Need this year (to find out more see 5 easy ways to raise money for BBC Children in Need). 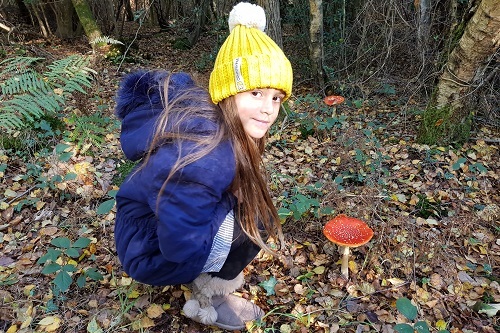 This is the oldest in her Pudsey hat with some of the toadstools we found dotted all over the forest bed – aren’t they magical?! I just love how this image turned out with the dappled sun on BB’s head making her hat shine brightly in contrast with the bright red of the toadstools. A proper autumnal picture! Love those yellow countryfile hats. That’s quite a toadstool there too!